Alejandro Campins & José Yaque, Installation image. All images courtesy of the Detroit Art Review. Wasserman Projects opened a new exhibition of work by two Cuban-born artists, Alejandro Campins and José Yaque on April 21, 2017, curated by Rafael DiazCasas, a curator based in New York City. The exhibition, City of Queen Anne’s Lace, grew from conversations when gallery owner Gary Wasserman saw the work of Campins while on a visit to Havana, Cuba in 2015 and had an intuition about the resurgence of art that grew out of a developing transformation, both here in Detroit and Havana. I visited the exhibition shortly after it opened to experience an installation by José Yaque that captivates one’s attention anew, a construction, Autochthonous Soil, built on a wood frame, 16 x 13 x 4’. 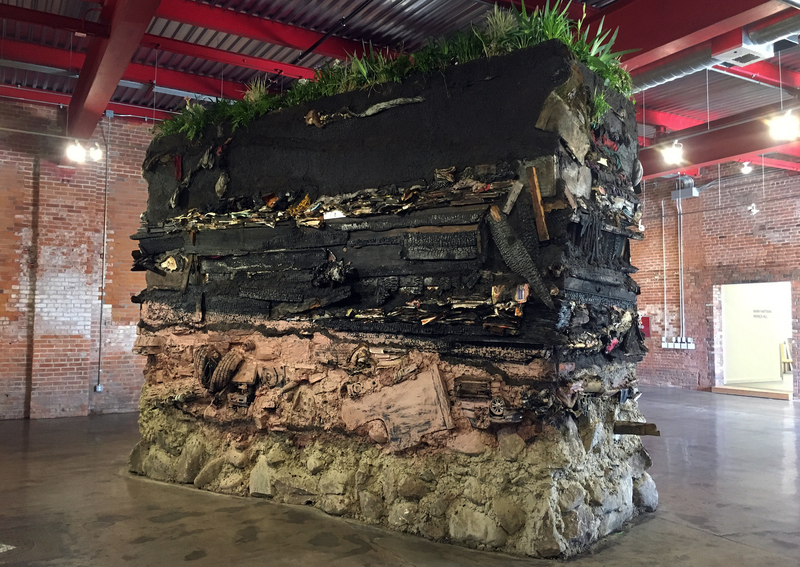 This rectangular mass depicts a cross-section of material indigenous to a collection of debris in and around the vacant lots of Detroit. The bottom is created from fieldstone bonded with mortar, followed upward by human created debris, then burnt housing remains, capped off with sod and flowers growing on the top level. The young Cuban artist, who lives and works in Havana, has created in his exhibitions a combination of works on paper, and installations. Recently, in 2015 while in residency, he created a large hurricane / tornado type installation stretched from floor to ceiling, encapsulating wood and metal debris, all tied together with straps of metal. It is as if once Yaque has an impression in mind, he executes the installation with a construction that communicates permanence, both in material and scale, resulting in a powerful impression. Drawn to urban landscape compositions, the installation is accompanied by a series of images on paper. 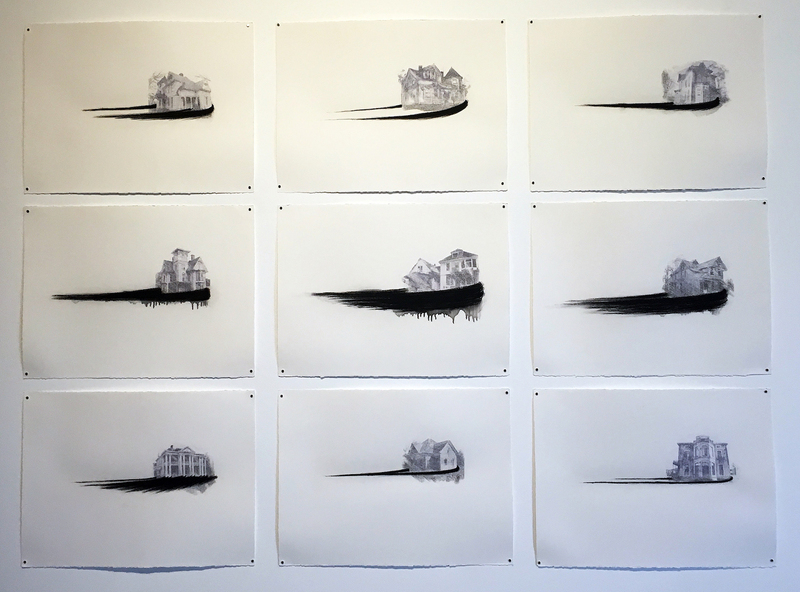 The series Detroit House, mixed media on paper, is a collection of nine images captured on his earlier visit to Detroit photographically, and then a photo transfer is made, and hand rendered charcoal is added to personalize the work. He provides the viewer with an architectural assortment of large dwellings that typifies housing styles constructed from the early part of 20th century in Detroit. His exhibition career began after studies in Cuba at the Superior Institute of Art, but has spread to include venues in Italy, France, London and the United States. 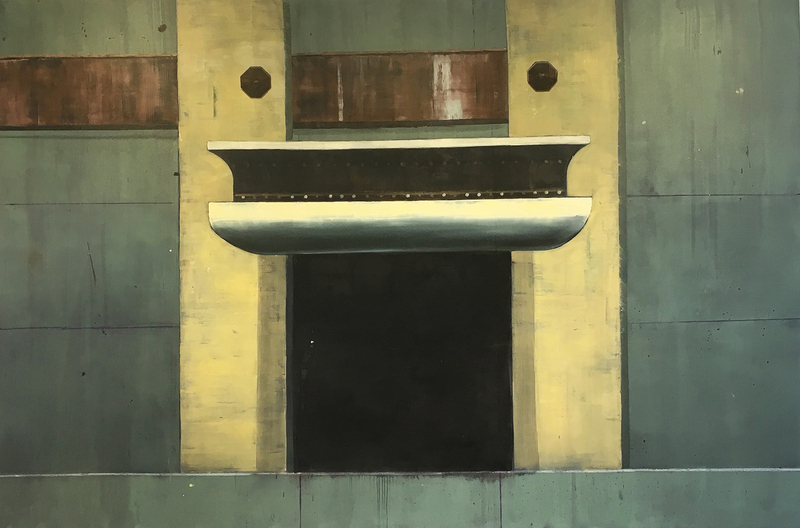 The work of Alejandro Campins provides the viewer with the large canvas of urban structures that speak to both representational imagery and abstraction. The work, Vientre ll, 102 x 152” relies heavily on composition, color, and scale. Although this image may rely on the reference from an architectural photograph, Campins provides the viewer with a romantic vision that blends history and memory. There are multiple elements that deliver on imagery that makes us feel secure. 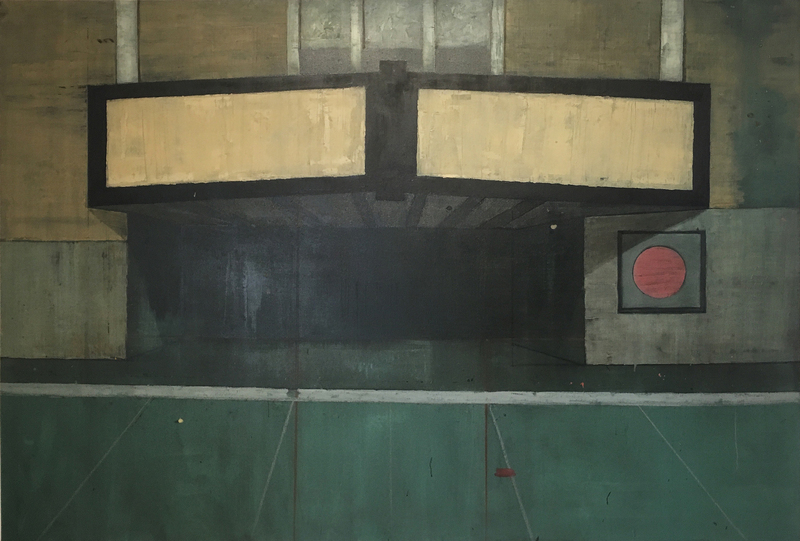 Added to the mix is subdued color and illusion, which draws the viewer into this dark centered box, where the artist decides to not continue with the brown rectangle above the protruding marquee. It is a strong example of combining representation and abstraction. Much of the same can be said of Vientre, 70 x 102” regarding representation and abstraction in one painting. The combination of formality presented with a heavy hand plays against the offset square with a red dot. In addition, the viewer is presented with a perspective that leads inward to a dark place, intentionally creating a secluded mystery. The work in these two paintings of abandonment creates metaphysical spaces veiled in silence and an unoccupied beauty of a time gone by. Alejandro Campins had his first exhibition, Lapse in the United States at the Sean Kelly Gallery in New York City in February 2016, where Kristine Roome writing for ArtFuse said, “Campins’ style and vision are expressly his own. And how could it not be? Formed by his experiences living on an ostensibly allochronic island, known for its cultural diversity – built from Spanish, African, French and Asian influences – Cuba is a curious place. 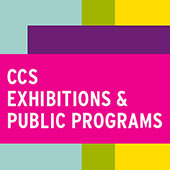 In a few short years, Campins has developed an impressive portfolio of solo exhibitions in Cuba and Spain, and has been featured internationally in biennials in Cairo, Lisbon and Havana.” Campins was named a finalist for the Farber Foundation as Young Cuban Artist of the Year in 2015. Wasserman Projects is guided by a spirit of exploration and collaboration in a space that seems to have no limits on its variety of experience and exhibition.